Land restoration is a key theme at the Global Landscapes Forum 2015 (GLF), the biggest side-event of the climate change negotiations in Paris in December. 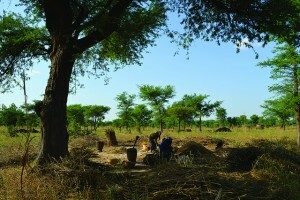 The World Agroforestry Centre (ICRAF) is hosting a discussion on the role agroforestry can play in restoring landscapes. The following is an interview with session organizer Henry Neufeldt, Head of Climate Change at ICRAF. Why is agroforestry an important instrument for landscape restoration? Trees on farms have many benefits. They create microclimates, enable carbon sequestration, support biodiversity, improve soil fertility and health, and provide nutrition. Most of these effects increase the resilience of the ecosystem by helping it to adapt and mitigate negative impacts/shocks. Fertilizer trees are particularly useful for land regeneration, soil health and food security; fruit trees are important for nutrition. How did you realize the potential of agroforestry for landscape restoration? It only works if there is a net positive return on investment. While the long-term positive benefits are evident, short-term returns are critical and need an integrated approach including annual crops and marketable products. People have to see that it works. This is necessary for short-term adoption rates and the long-term success of landscape restoration. Are there any best practice cases of successful landscape restoration through agroforestry? Through farmer-managed natural regeneration (FMNR) in Niger, 5 million hectares of farmland have been restored in the past 20 years, with no outside investment costs and no recurrent costs to government. During this time, 200 million new trees were planted, and this increased annual food production by at least 500,000 tons. A total of 1.25 million farm households were involved, and 2.5 million more people were fed through the vast increase in fodder for livestock production. Why do you want to bring the topic to GLF 2015? Landscape restoration through agroforestry contributes to climate change mitigation and adaption and to other ecosystem services; and it improves the livelihoods of smallholder farmers. Our discussion at the Global Landscapes Forum 2015 will focus on tree-based approaches to regaining ecological functionality and enhancing human well-being across degraded farming landscapes in the tropics. What is your previous experience with GLF? Which role does it play in shaping the discussion around land use? The World Agroforestry Centre has been involved in the Global Landscapes Forum as an implementing partner. For us, the forum presents a valuable opportunity to raise awareness, engage with stakeholders and decision-makers and contribute to evidence-based decision making. Henry Neufelt is Head of the Climate Change Unit at the World Agroforestry Centre (ICRAF) in Nairobi, Kenya. The unit focuses on climate impacts, adaptation, mitigation, food security and sustainable development in the context of agroforestry systems. He is particularly interested in questions related to the governance, economics and scalability of biocarbon projects and climate-smart agriculture; quantitative benefits of improved NRM to adapt to climate shocks; and measurement and modeling of GHG fluxes from complex agro-ecosystems. He is also the ICRAF focal point for the CGIAR Research Programs on Climate Change, Agriculture and Food Security (CCAFS) and Forest, Trees and Agroforestry (FTA).